The vast socio-economic and cultural diversity of Indian Nation has contributed to its wide variety of traditional occupations. A majority of these occupations engage a large number of unorganized sector workforce and involve manual labor. In eastern part of India, in the state of West Bengal, the occupation of sweet making (confectionery work) has developed over centuries. In Bengal, sweets are fondly eaten throughout the year in all occasions. The huge demand of sweet has therefore become an integral part of Bengali life and culture which calls for its extensive production. The sweet making business or the confectionery work, as a result, has evolved as a major small-scale unorganized sector in the state. In Indian context, a majority of the work physiological studies have focused on jobs that are characteristically dynamic and arduous in nature and performed outdoor. In the last few decades, many such studies have been conducted on determination of physical workload and heat exposure on various occupations, such as stone cutting,  unskilled building construction jobs,  inland fishing, ,, mining, , agriculture , work. The confectionery or sweet making represents one such occupation which is still unexplored from work physiological and ergonomic viewpoint. In this context, the present study aims for evaluating the physical work stress involved in this occupation. In accordance, physiological work stress is assessed in terms of certain cardiac strain indices in young and older workers during summer and winter. The study intends to focus on the seasonal variations in physiological response of both the groups respect to their activity and ambient temperature during work shift in both the seasons. A total of 33 subjects were selected from 8 different shops of Kolkata, eastern India. The shops were matched for their total number of workers, daily production, workers' salary, size of kitchen area, and work methods. All workshops were located on the ground floor. Two criteria were used for subject selection: full-time involvement in the profession with a minimum work experience of 5 years and no current diagnosed illness. All the workers were married and were living away from their family. Prior to the study, the subjects were explained about the design of the study and the extent of their involvement. Except two subjects, all showed their willingness to comply with the protocol of the study. Three subjects were unavailable for the seasonal comparison. Each subject was examined for three working days of a single week in both summer (May - June) and winter (Dec - Jan). In both the seasons, the study was conducted in the morning between 6.00 and 15 .00 hrs. It ensured that the subjects were regularly involved in their job for at least 2 weeks before the study. Regardless the season, the tasks performed by the workers of all the shops were similar in nature and were done manually. During the entire shift, the workers performed different tasks of sweet production which are repeated in a single work shift. The description of these activities and their duration and frequencies are presented in [Table 1]. The total time required to perform these works is termed as the productive period. In addition, the workers were also engaged in non-specific activities like milk weighing, utensil cleaning, milk pouring spreading fried sweets in syrup, etc. Rest pauses include voluntary rest pauses when the workers took breakfast or meals or a few minutes rest. The subject's ages ranged between 26 and 55 years. They were classified into two age groups: younger group (YG) having below 40 years of age (n = 12) and older group (OG) having ages between 40 and above (n =16). Resting heart rate (RHR) was obtained in a seated position after a rest period of ≥30 minutes at a comfortable room temperature in the morning before the beginning of work. The maximum heart rate (MHR) was considered to be 220 less the age of the subjects in years  and heart rate reserve (HRR) was obtained as the difference between MHR and RHR. Heart rate during work and recovery was the principal physiological parameter measured. Working heart rate (WHR) was monitored by a telemetric heart rate monitor (PE 3000, Polar Electro 3000 Finland). Monitoring was done continuously for 90 min in three phases; in between 6.00 and 9.00 hrs, 9.00 and 12.00 hrs, and 12.00 and 15.00 hrs. In all three phases, heart rates were recorded at every 1 min interval. Net cardiac cost (NCC) and relative cardiac cost (RCC) and limit for continuous work (LCW) were used as indicators of the cardiac strain. NCC was determined as the difference between resting heart rate (RHR) and WHR. RCC was obtained by expressing the heart rate at a given workload as the percentage of heart rate reserve (HRR) of a particular individual to depict the relative intensity of workload. It is calculated as: RCC = NCC / HRR * 100. , Limit for continuous was obtained for individual worker by adding 30 beats with his resting heart rate. For a more detailed insight into the workload, RCC was categorized into different class interval; 0-10, 11-20, 21-30, 31-40, and 41-50. The amount of time workers remained in these stress level was determined and expressed as percentage of the working period. PDI ≤ - 10 beats per min and all RHRs below 90, then recovery is normal. PDI < - 10 beats per min and RP 3 > 90 beats/min, then it is considered as no recovery. Each subject responded to a questionnaire regarding their annual, monthly and daily work engagement. On site observations were conducted for work study. This was done manually by a stop watch to record the duration of different tasks and rest pauses. No instruction was given to the workers to control their work method and work pace. The following environmental variables were measured to assess heat stress prevailing in the work place. The dry and wet bulb temperatures were measured using an Assman Hygrometer. Globe temperature was measured using globe thermometer. Relative humidity (RH) was determined by the depression of wet bulb from a relative humidity table. All the environmental data were recorded at every hour in the work places throughout the shift in both the seasons. Students' paired t-test was used to compare seasonal (summer and winter) temperature readings and cardiac response between each group of workers. A comparison of cardiac response between groups was done by the unpaired t-test. A seasonal comparison of different variables of work load and physiological responses was done by the Wilcoxon signed rank paired comparison on 12 pairs of means for the younger group and 16 pairs for the older group of workers. Differences were considered statistically significant when P < 0.05. The physical, physiological and professional characteristics of the subjects are summarized in [Table 2]. The height and weight of the workers are similar to the average population from eastern India. The seasonal variations of workers engagement and pattern of workload is summarized in [Table 3]. Working days per month was evaluated by the questionnaire study and the mean corresponds to the average value of 12 responses from the younger group and 16 responses from the older group. Other variables were obtained from on-site observation conducted for three workdays per worker. 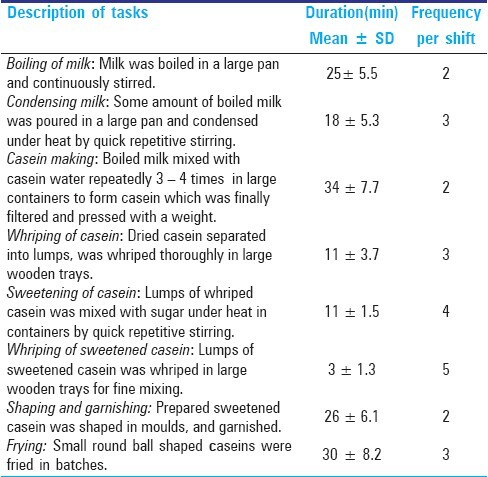 Table 3: Characteristics of workload in confectionary work for young (YG) and older (OG) workers. Working days per month was higher for the older group in summer but similar in winter as compared to the younger group. Both the groups demonstrated a significant variation in different work periods in both seasons except total working hour and the period of rest pause, which were similar in both the groups during summer. The productive period was higher and non-specific work periods were lower for the older group as compared to the younger counterpart in both seasons. Time spent by the older group in productive period varied between 83% and 85% of the total work shift. Rest periods were almost similar in summer for both groups. However, rest time was significantly more for the younger group in winter. Both the groups demonstrated a significant seasonal variation on these two variables. Seasonal comparisons of cardiac strain indices are presented in [Table 4]. Descriptive statistics comprising mean and standard deviations are given from a total of 36 workers day observation for younger and 48 workers day observation for older groups. Mean WHRs were high in both seasons for both groups of workers. Irrespective of the groups, values of cardiac strain indices were significantly higher in summer. The PDI did not show any seasonal variation for the older group of workers. Statistical analysis of the intergroup comparison revealed that except WHR, all cardiac strain indices were significantly higher for the older groups in winter. The RCC was the only parameter which was higher in the older group during summer. Profile for RCC in confectionary work is presented in [Figure 1]. Profiles of both the groups were different in the two seasons. During summer, the RCC above 30 was recorded for 25% of the work shift in young workers and 47% of the work shift for older workers. In winter, the RCC was above 30 for 29% of work shift for the older group only. Young workers spent more than 50% of shift time at a RCC level of 21-30 during summer and 11-20 during winter. In contrast, for older workers, nearly 50% of work shift was spent at an RCC level of 31-40 in summer and 21-30 in winter. Heat stress prevailing in the workplace is summarized in [Table 5]. Mean and standard deviations are calculated by clubbing the values obtained for both young (36) and older group (48) workers day. Seasonal comparisons were done by the paired t-test analysis between 12 pairs of summer and 16 pairs of winter means. This indicated that a hotter and humid thermal environment was prevailing in the workplace during summer. All the parameters measured showed a significant amount of difference in the seasonal comparison. The seasonal comparison of WBGT recorded during young and older worker workdays in two seasons is presented in [Figure 2]. 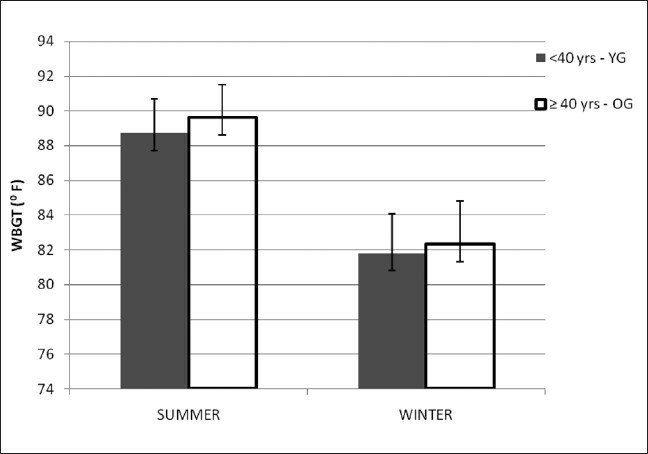 The values significantly differ among the groups in summer (P < 0.05, unpaired t-test), but were almost similar during winter. The physiological gradations of different activities have been proposed by researchers in the field of work physiology based on heart rate during work and recovery. Intensity of workload of the confectionary workers judged in accordance with the scales of heaviness based on WHR. Based on this classification, the work load entailed in confectionary work could be classified as moderate in nature. A WBGT of 27.5-28.5°C (81.5-83.3°F) has been recommended for "moderate" task with work periods ranging from 100% to 75% of total work shift for acclimatized worker. In the present study, the subjects may be considered as acclimatized due to their full-time involvement in their job with a minimum work experience of 5 years. Moreover, all the subjects were regularly involved in their job for at least 2 weeks prior to the study. This had negated any possibility of short time acclimatization that might occur when away from heat for a short period and reduced heat tolerance. Therefore, taking into consideration the work-rest regimen of the workers throughout the shift, it appeared that the mean WBGT of 89.2°F during summer was above the recommended range and had imposed thermal load on them. However, the mean value of WBGT during winter for both groups was within the recommended range. The present study design is based on seasonal comparisons. It intends to examine the combined effect of thermal and work stress on cardiac responses. It can be stated that the nature of workload in both seasons with subsequent variation in ambient temperature have influenced the magnitude of the physiological reactions for both groups in two seasons. Studies have revealed a conspicuous variation in ambient thermal conditions in both the seasons in terms of WBGT. Some variations were also observed for differences in inter seasonal work periods. In summer, the total working and rest periods were similar for both the groups, with extended periods of productive periods for the older group. 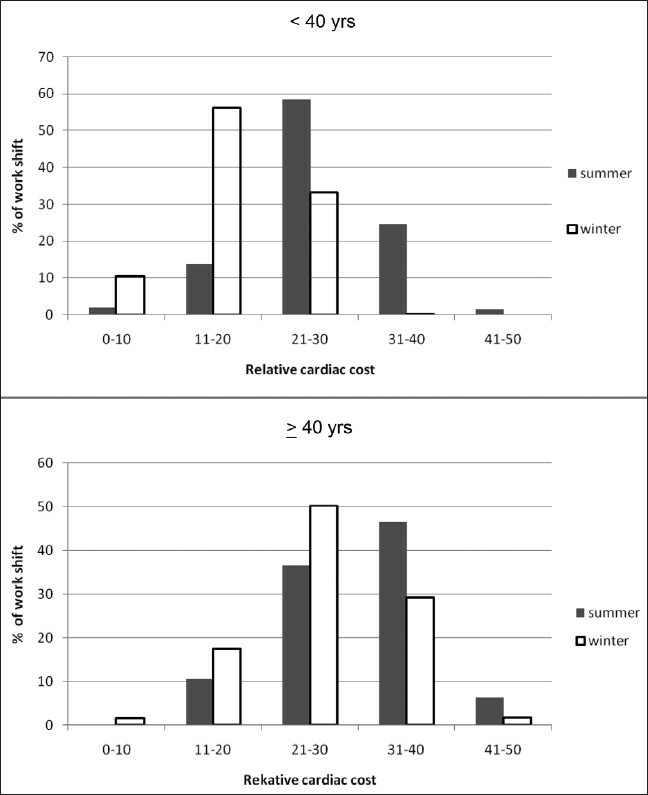 These variations in conjunction with increased heat load might have contributed to the higher level of cardiac strain for older subjects in summer. The no-recovery pulse patterns observed for both the young and older workers in summer reflected the combined effect of workload and thermal environment. The magnitude of physiological strain for young workers in winter was within recommended range, the work periods are less as compared to summer. This finding may indicate that the winter values of cardiac strain of young workers might be representative of the baseline work-related hemodynamic efforts. The present study work load was compared in terms of duration of different work periods. It would have been ideal if productivity could have been compared between summer and winter in order to quantify the difference in workload in both seasons. Unfortunately, due to the unwillingness of the owners of shops to reveal their actual productivity, the difference could not be empirically documented. The work situation in the present study was not controlled; work was performed at a self-chosen pace. It is documented that in self-paced work, workers adopted themselves to work so as to regulate the strain on their cardiovascular system. In the present study, although evidence of cumulative fatigue was obvious from delayed recovery particularly in summer, RCC of the workers were within recommended limit which indicated a similar type of adaptation to work. Moreover, the entire days work comprised of different task, which vary in their intensity level. These tasks were conducted both in summer and winter. A combination of these works throughout the work shift interspersed with periods of rest pauses might have prevented the worker from experiencing an extreme level of cardiac strain. The work exposure time of the confectionary workers appeared to be much higher than the industrial situation with work spanning for eight hours per day. The present study has reported the work stress related to the day time work. Emphasis should be given to the point that in this unorganized sector, the work is resumed during evening, when the workers were re-exposed to heat of the cooking ovens. The heat exposure limits suggested for industrial situation therefore should be reduced to a lower level for this group. It has been suggested to reduce the permissible exposure time for subjects from industrially developing countries. It can be well apprehended that extensive working hours in confectionary work in conjunction with increased heat load particularly in summer season, had imposed a considerable amount of physiological strain particularly on the older workers. The majority of the workers in the unorganized sector are from the indigent part of society and a lack of awareness on health and safety issues is very common among these groups. This in turn has made them very much unaware about the balance between their work ability and job demand as had shown earlier. It was also pointed that they are more likely to be affected by diseases prevailing in the community  and thus considered less healthy. A cursory examination of work place also revealed poor housekeeping, illumination, and ventilation of the different workplaces studied which have also contributed in increasing the work stress. The present study can be extended to evaluate the work load entailed in a whole work day, along with specific physiological stress connected with an individual task. By cursory examination, ergonomic stressors were identified in workplace as well as in connection with individual tasks. These identifications necessitate an ergonomic intervention which indicates further scope of the study. The authors strongly felt that an occupational health and safety awareness program is urgently required for an unorganized group of workers in the context of developing country. The authors wish to express their appreciation to all the shop owners for their sincere cooperation. The authors are also duty-bound to express their gratitude to all the confectionery workers who volunteered in the study. 1. Ramanamurthy PS, Dakhyani R. Energy intake and expenditure in stone cutters. Indian J Med Res 1962;43:57-61. 2. Sensarma SK, Samanta A, Ramanathan NL. Physiological cost of some unskilled building construction jobs. Indian J Occup Health 1975;15:21-30. 3. Biswas R, Samanta A. Physiological cost of pond fishing. Indian J Physiol Allied Sci 2005;59:58-68. 4. Biswas R, Samanta A. Physiological assessment of work stress in inland fishing task. Asian J Ergon 2005;6:27-39. 5. Biswas R, Samanta A. Assessment of physiological strain in inland fishing activity. Indian J Occup Environ Med 2006;10:19-23. 6. Saha R, Dey NC, Samanta A, Biswas R. A Comparative study of physiological strain of underground coal miners in India. J Hum Ergol 2007;36:1-12. 7. Saha R, Dey NC, Samanta A, Biswas R. Evaluation of physiological strain of shovellers in underground coal mines in India. Ergonomics 2010;22:33-48. 8. Nag PK, Dutta P. Cardiorespiratory efficiency in some agricultural work. Appl Ergon 1980;11:81-4. 9. Ghosh S, Kar SK, Sahu SK, Banerjee S, Dhara P. Cardiovascular stress of women engaged in different paddy cultivation acivities. Indian J Physiol Allied Sci 2003;57:74-82. 10. American Conference of Governmental Industrial Hygienists). Threshold limit values for Chemical Substances and Physical Agents and Biological Exposure Indices. In: 2000 TLVs and BEIs. Cincinnati: ACGIH; 2000. 11. Sanchez J, Monod H, Chabaud F. Effect of dynamic static and combined work on heart rate and oxygen consumption. Ergonomics 1979;22:935-43. 12. Bezucha GR, Lenser MC, Hanson PG, Nagle FJ. Comparison of hemodynamic responses to static and dynamic exercise. J Appl Physiol 1982;53:1589-93. 13. Neilsen R, Meyer JP. Evaluation of metabolism from heart rate in industrial work. Ergonomics 1987;30:565-72. 14. American Heart Association, Committee of exercise. Exercise testing and training of apparently healthy individual: A handbook of physician. New York: American Heart Association; 1972. 15. Trites DG, Robinson DG, Banister EW. Cardiovascular and muscular strain during a tree planting season among British - Columbia silviculture workers. Ergonomics 1993;36:935-49. 16. Costa G, Berti F, Betta A. Physiological cost of apple farming activities. Ergonomics 1989;20:281-6. 17. Grandjean E. Fitting the task to the man. A text book of Occupational Ergonomics. 4 th ed. London: Taylor and Francis; 1988. 18. Brouha L. Evaluation of the physiological requirements of jobs. In: Physiology in Industry: Evaluation of Industrial stress by the physiological reaction of the workers. London: Pergamon Press; 1960. 19. NIOSH. Criteria for a recommended standard-occupational exposure to hot environments. U. S. Department of Health, Education and Welfare, National Institute for Occupational Safety and Health, HSM 72 - 10269. Washington, D.C.: Government Printing Office; 1972. 20. Vogt JJ, Libert JP, Candas V, Dauli F, Mairiaux PH. Heart Rate and spontaneous work cycles during exposure to heat. Ergonomics 1983;26:1173-85. 21. Green MS, Luz Y, Jucha E, Cocos M, Rosenberg N. Factors affecting ambulatory heart rate in industrial workers. Ergonomics 1986;29:1017-27. 22. Gertner A, Israeli R, Cassuto Y. Effects of work and motivation on the heart rate of the chronic heat exposed workers during their regular work shifts. Ergonomics 1984;27:135-46. 23. Åstrand PO, Rodhal K. Textbook of work physiology. New York: McGraw Hill; 1986. 24. McNeill MB, Parsons KC. Appropriateness of international heat stress standards for use in tropical agricultural environment. Ergonomics 1999;42:779-97. 25. Dey NC, Samanta A, Saha RD. Assessment of cardiac strain amongst underground coal carriers- A case study in India. Int J Ind Ergon 2007;37:489-95. 26. Phoon WH, Tan KT. Environment standards at the workplace. In: Jeyeratnam J, editor. Occupational Health in developing countries. Oxford: Oxford University Press; 1992. p. 359-67.